Reading to Sierra Elementary School students. 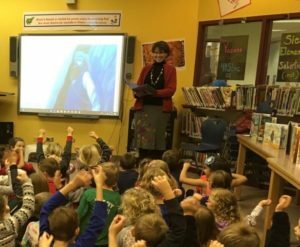 I love to do school visits! Please contact me! PRESENTATIONS: My standard presentation is a fun powerpoint that takes my listeners through my writing process of getting ideas, prewriting, drafting and revision. I also share how a story becomes a published book. These presentations last about 45 -50 minutes each and can be done for larger groups of students.Often times, teachers will tell me what information they want me to emphasize or cover, and I can add that in. For instance last year at one school that I visited, the 6th graders were struggling with how to come up with ideas for their writing. I added in extra info on how I generated ideas in my own writing to address that school’s need. WRITING WORKSHOPS: Some schools have me come in and lead writing workshops with smaller groups of students. (One or two classes at a time.) The workshops can be part of a school visit where I am also giving presentations to larger groups, or it can constitute my whole visit. Again, I am flexible and enjoy coming up with lessons to fit your school’s individual needs. This year, I did a school visit where I gave my general presentation to all of the 2nd and 3rd graders in the school, and then did writing workshops with smaller groups of the same kids. This way, each of the 2nd and 3rd graders got general information and then a specific lesson. WRITING WORKSHOPS FOR ADULTS: For the past two years I have led writing workshop for adults who want to start writing but need that little extra push to get started. When the group first meets we scheduled six sessions. I start each session by teaching a short writing lesson, based on the needs and the level of the group. After that, each writer shares the writing piece that they are working on and the group gives them feedback.. Some of the writers were interested in writing for publication and some were teachers just interested in getting to be better writers. Almost all genres were covered. If you are interested in something like this,get a group of fellow writers together and let me know. I need at least group of 5 to make it worthwhile. This applies to Boulder, Denver, Longmont, and Lafayette area writers. Feel free to email me with questions about the presentations and also for fees.